Cake Decorating School & Suppliers of Speciality Cakes! Welcome to Creative Cakes! We specialise in the sale of unique 3D cakes. Visit our cake gallery to view our work. If you are interested in learning how to create your own 3D cakes for birthdays or other special events, we suggest you join us at our next Cake Decorating Class hosted throughout the year in Cape Town, Johannesburg and Durban. Click here to find out the details of our next workshop. We also offer an AMAZING jam-packed DIY e-book filled with all of Carol's secrets, recipes and instructions. Learn to create a wide range of 3D cakes yourself, at home. Carol's Beginners 3D Cake Decorating E-Book really is a must-have for all cake decorating enthusiasts! 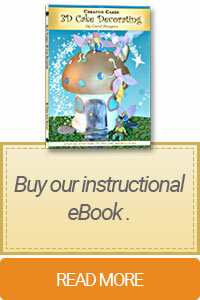 Click here to find out more about our E-Book. 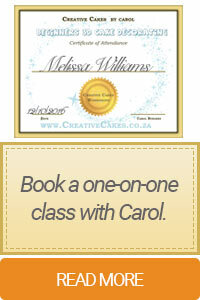 Learn from the best in the field, Carol Burgers and become a master cake decorator in no time! 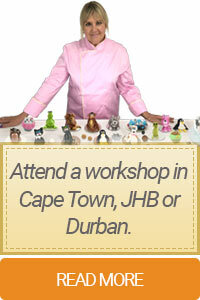 Book a one-on-one with her, or join us in a group class in Cape Town, Johannesburg & Durban. "The course was fabulous. I had so much fun! What I really loved was the fact that Carol uses all kinds of everyday stuff to create her fabulous cakes. I live on a farm in the middle of nowhere, so I really appreciate her practicality and cost effective ideas. She makes everything seem simple. It was a wonderful learning experience that I can highly recommend to my friends." "Thank you for the beautiful Noddy cake you made for Deven's 4th birthday. It was not only beautiful but delicious too. Thanks again!" With the cake being the focal point of most birthday parties, we believe that it is important to have something unforgettable. That doesn't mean spending an arm and a leg either! From kids birthday cakes, to something for your boss, or even a naughty cake, anything is possible and no ideas or themes are too unusual. Each cake is hand sculptured and is 100% unique, making the options endless! Creative Cakes prides itself in making new designs, so don't hesitate in asking for the unique cake of your dreams! If you have any questions that have been unanswered, please email us using the form on our contact page.